Design Bridge in London has designed the branding for a range of snacks that launched in the UK last month. The Joseph Banks cassava root chips are aimed at health conscious consumers. They are low in fat, gluten free and cholesterol free. Design Bridge's packaging was influenced by the ideas, principles and enthusiasm of Joseph Banks, the 18th century naturalist and botanist. These influences are communicated across the brand, from its identity and packaging through to promotional materials and sales collateral. The 113g packs were manufactured by Maxindo in Indonesia. 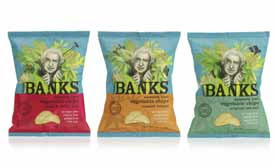 Joseph Banks Cassava Chips are the first product launch from the brand, which is owned by Unique Food Group in New Zealand, and are available in four flavours from UK supermarkets.